PITTSBURGH (AP) — A.J. Burnett scattered four hits over seven innings, Russell Martin hit a three-run homer and the Pittsburgh Pirates beat the St. Louis Cardinals 7-1 on Saturday night to regain sole possession of the NL Central lead. Burnett (7-9) gave up one run while striking out six and walking one. 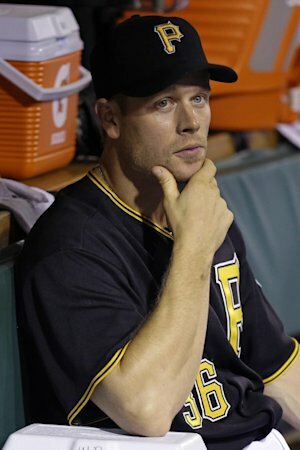 He received plenty of offensive help only hours after Pittsburgh acquired first baseman Justin Morneau from the Minnesota Twins. Morneau arrived in the Pirates’ dugout in the sixth inning. By then Pittsburgh had things well in hand. Martin keyed a five-run second with his drive off Lance Lynn (13-9). The trade for Morneau marked the second big move by the Pirates in five days as they try to beat out St. Louis and Cincinnati in baseball’s tightest division race. 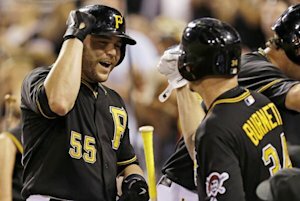 Pittsburgh brought in Marlon Byrd and John Buck from the New York Mets on Tuesday. Byrd homered in his Pirates debut on Wednesday. Morneau won’t get a chance until Sunday at the earliest. Manager Clint Hurdle hoped Morneau would be available on Saturday night if needed. Hardly necessary after Pittsburgh jumped on Lynn early. The right-hander has struggled since winning his 13th game of the season in a romp over Cincinnati four weeks ago. He dropped his fourth straight decision Saturday when he could do little to harness an offense that is starting to heat up heading into September. Pittsburgh ranks 10th in the NL in runs scored, one of the main reasons general manager Neal Huntington aggressively pursued Morneau. But the Pirates are averaging 5.2 runs per game during their current six-game homestand and Morneau’s addition gives Pittsburgh another proven bat to join MVP contender Andrew McCutchen and slugging third baseman Pedro Alvarez. For a night, however, it wasn’t McCutchen or Alvarez but role players who provided the pop. Burnett got Pittsburgh started with an RBI single in the second and Jose Tabata followed with one of his own to stake the Pirates to a 2-0 lead. It could have been worse after Lynn loaded the bases before striking out McCutchen to get out of the jam. Lynn wasn’t so fortunate one inning later. Alvarez led off with a double, Byrd singled him home and Garrett Jones walked. Martin stepped in and sent a fastball into the front row of seats in right-center for his second homer in two nights to give Pittsburgh a 6-1 lead. Walker added an RBI triple later in the inning. While Lynn managed to stay in the game, he left after four innings following a miserable start in which he gave up seven runs on 10 hits with three walks and four strikeouts. His ERA rose to 4.29. The deficit proved far too large for a suddenly reeling offense. The Cardinals lead the NL in batting average and runs but have scored just once in their last three games. Burnett’s control had something to do with it in front of the second-largest crowd in the 12-year history of PNC Park. 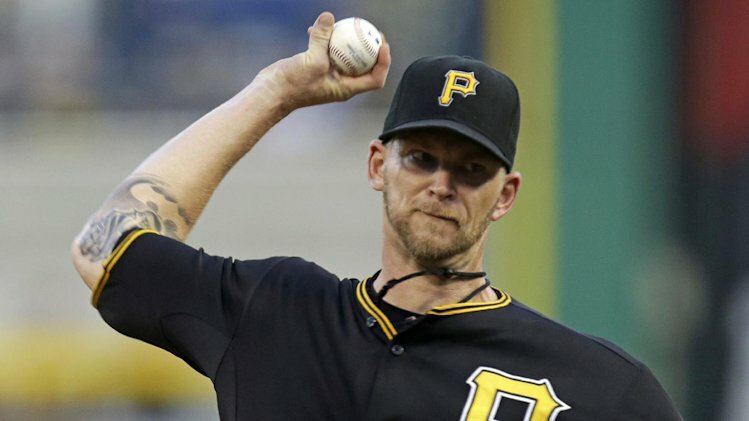 Working both sides of the plate effectively, Burnett assured Pittsburgh heads into the final month of a remarkable season in first place for the first time since it won the NL East in 1992. NOTES: Reliever John Axford, acquired on Friday from Milwaukee, pitched a perfect seventh in his Cardinals debut. … The Pirates have outhomered St. Louis 18-3 in 15 meetings this season. … St. Louis SS Pete Kozma grounded out while pinch-hitting for Lynn and is hitless in his last 29 at-bats. … The series concludes Sunday. Joe Kelly (6-3, 2.91 ERA) starts for St. Louis against Kris Johnson (0-1, 3.00). … The Cardinals have not settled on a starter for Tuesday in Cincinnati. Michael Wacha, Carlos Martinez and Tyler Lyons are all under consideration. This entry was posted in Yankees and tagged Pirates beat Cardinals 7-1 to take NL Central lead by edb23. Bookmark the permalink.